Many of you know that Mr. Handsome and I have a niece and a nephew. They are the children of one of Mr. Handsome’s sisters, who is due with her third (it’s a boy!) this fall. Another one of his sisters (he has four, but only two are married) is expecting a baby in the next few weeks. She didn’t find out the gender and is keeping her name ideas a secret, so we are all eager for the child to arrive. A few weeks ago, we threw a baby shower for the sister who is pregnant with her first. 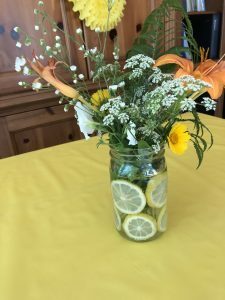 The theme was “You Are My Sunshine,” since it will be a summer baby, and the mom-to-be loves the color yellow….